You will not be able to tell us apart, Halle and me. I am on that journey to my natural color hair – now about 80% silver and 20% brown (I’ve never been a natural blonde, but I sure have enjoyed being a decided blonde). I’m envious of my short-haired friends making the same journey. Have you seen how fabulous Judith‘s hair looks as she allows the silvers to grow in? Judith has a beautiful ombre effect. Source. I’m not ready to cut my hair, so this is going to take some time. The contrast between my natural hair and colored hair isn’t too dramatic, but you can see the demarcation line. Keeping my hair messy does help. Silver and gold. This is my hair now. So here’s my plan, and perhaps it’ll help some of you considering the change. 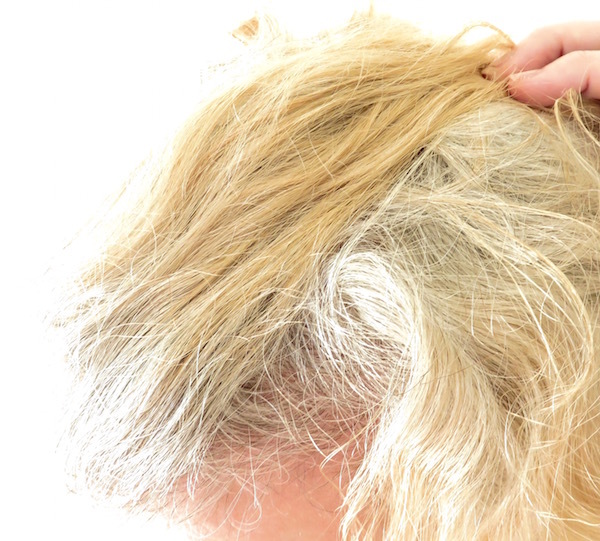 If you’re blonde, have your hair toned, or do it yourself to reduce the yellowish tints and enhance the silvers. Toning isn’t damaging to your hair if done properly, and I do this every two months or so. The big guns: have your stylist (unless you’re really hair-skilled, this is a job for professionals) “highlight” your hair with palest tones – for me that’s almost-white. This does involve lifting color, aka bleaching. It’s not nurturing, especially for those of us with fine, thin hair. But my stylist has been using a product with an oil base (similar), as gentle as she can find. The results are fabulous, but because of the bleaching involved, I’m indulging two to three times a year. Use a purple-toned shampoo and/or conditioner. I found the Fashionista shampoo too drying, so I went back to my sulfate-free L’Oreal shampoo, and use the purple Fashionista conditioner. I leave it on for about three minutes. I don’t know that this has much effect, but I feel like I’m doing my part. Use hats, headbands and scarves. And if you’re willing, use hairpieces that cover your roots. I have a couple of “toppers” that blend with my hair at the bottom, but fully cover the top. Patience. Haha! I distract myself with bright nail polishes, lipstick, and a sassy attitude. Judith’s hair is wonderful. I started going grey in my late 30s and in my early 40s started dye-ing. Gave up the bottle 2 years ago because it was getting ridiculously expensive. I’m embracing the transition which may be with me for ever. My mum who had dark black hair is still salt & pepper in her 80s so I guess that’ll be me now! Great tips here. Thanks for link this post up to my very first Style Story Link Up! I wrote a post about letting one’s hair go natural awhile back on my blog. For now, I’m surprisingly still able to simply tweeze out my whites. It’s very surprising since I’ve only known my mom with her gorgeous white hair. She’s famous where I’m from for it. I don’t know why, but at 43 I haven’t started yet. But if I do, I hope to go natural. Purple shampoo is going to be your very best friend as you transition. You look great always but all the best with the grow out. Growing out one’s hair is tough no matter the reason. I’m short now–actually for almost a year! I can’t decide if I should keep it short or grow it back out to long. Since I don’t color sometimes I think I should take advantage of not having to and wear my hair long. Can’t decide…. Thanks again for linking up Patti! Great tips Patti. I love your silver and gold combination. Since your hair is long, your journey will be longer than mine, but so intriguing. I’m going “cold turkey” and almost there. Surprisingly, it’s been fun and I’m liking the changes. Thanks for the mention, and I will be following your process.